Alfred W. McCoy (Editor), Francisco Scarano (Editor). 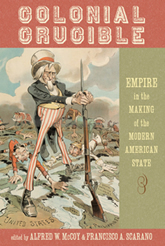 Colonial Crucible: Empire in the Making of the Modern American State. Madison: University of Wisconsin Press, 2009. At the end of the nineteenth century the United States swiftly occupied a string of small islands dotting the Caribbean and Western Pacific, from Puerto Rico and Cuba to Hawaii and the Philippines. Colonial Crucible: Empire in the Making of the Modern American State reveals how this experiment in direct territorial rule subtly but profoundly shaped U.S. policy and practice—both abroad and, crucially, at home. Edited by Alfred W. McCoy and Francisco A. Scarano, the essays in this volume show how the challenge of ruling such far-flung territories strained the U.S. state to its limits, creating both the need and the opportunity for bold social experiments not yet possible within the United States itself. Plunging Washington’s rudimentary bureaucracy into the white heat of nationalist revolution and imperial rivalry, colonialism was a crucible of change in American statecraft. From an expansion of the federal government to the creation of agile public-private networks for more effective global governance, U.S. empire produced far-reaching innovations. Moving well beyond theory, this volume takes the next step, adding a fine-grained, empirical texture to the study of U.S. imperialism by analyzing its specific consequences. Across a broad range of institutions—policing and prisons, education, race relations, public health, law, the military, and environmental management—this formative experience left a lasting institutional imprint. With each essay distilling years, sometimes decades, of scholarship into a concise argument, Colonial Crucible reveals the roots of a legacy evident, most recently, in Washington’s misadventures in the Middle East.